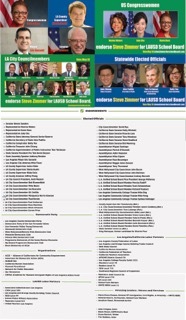 Re-election campaign website for Steve Zimmer for School Board President. Site was re-designed and re-populated. Steve Zimmer is the former President of the LA School Board and was in the middle of a pitched battle, not just to get re-elected, but to protect our public schools and to make sure that our children, grand children, cousins and sisters and brothers can reach their dreams. His 25 years of service as a teacher, counselor, member and now President of the School Board have brought benefits to many individual students and families and all of us as a community.